Lindon City has several service opportunities available. If you are interested in being involved in these projects or have another idea for a service activity, please contact us. Service projects can include opportunities for families, youth groups, Scouts, and neighborhood groups. Your willingness to serve our community is greatly appreciated. The focus of the Eagle Scout project is concentrated on developing leadership skills and providing service to a local institution or the community. Your involvement in an Eagle Scout project will have a lasting impact on you and the members of your community. Lindon City is anxious and excited to begin working with you on your project! We hope that you are excited, as well. The following information will assist you in getting your project started with Lindon City. Please complete the Eagle Scout Project Application and the Volunteer Service Application, which will provide us with the necessary information regarding your proposed project. This will also help us to ensure that your project is started in a timely manner. Once the Eagle Project Application is completed, it will be emailed to Lindon City and your project will be placed on the schedule. Upon approval of your application, and prior to starting your project, the City will email you with any additional information concerning the scope and details of the project. Complete all pages in the Eagle Scout Service Project Proposal (through page 2-4), then contact the city representative for a signature. A big portion of your project may be the raising of adequate funds to complete the project. The Lindon City can sometimes provide funding for projects. However, please don't assume that every project will be funded by the city. It is the responsibility of the Scout to provide funding for the project through donations of time, material and/or money from members of the community. The city has limited funds and only, in rare circumstances, will participate in funding the project. Lindon City receives many requests each year to provide Eagle Scout projects. 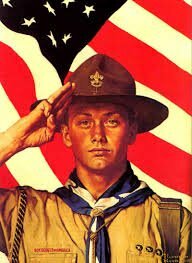 Please remember, it is the responsibility of the Scout, in keeping with the spirit of the Eagle project, to approach the city with their own idea for a project and then to work closely with the city in implementing the proposal. We invite you to tour the city, looking for areas that need improvement. Organize a Tree Care Project for a neighborhood, city street, or city park. Help improve or construct walking & biking trails in designated areas of the city. Sponsor/chair an event at the annual Lindon Days Celebration in August. Fund raise, purchase and install various park features, including playground equipment, picnic tables, park benches, pavilions, etc. Elderly residents may have difficulty changing their own carbon monoxide or smoke detector batteries. House numbers on homes are incorrect, missing or are not visible from the roads which may result in emergency services delays. House numbers painted on curbs are sometimes helpful to emergency responders but not all homes have the numbers on the curb. Residents are often unprepared to evacuate with their pets in the case of a wildfire or other evacuation scenario Large animal evacuations have been difficult in previous wildfire incidents due to the lack of lead ropes, halters, etc. Youth sports teams may not have adequate first aid kits to distribute to coaches for use during practices or games. Fire hydrants may need to be repainted in certain areas of the city. Vehicle access gates along the city trails may need to be repainted. Horse arena panels may need to be repainted. Trees have died along city trail areas (specific trees are required by city ordinance and landscaping design). Signs in need of repair, replacement or reconsideration (e.g. yield versus stop sign) need to be identified. An evacuation center kit needs to be assembled with the correct forms, directional signs and supplies to be used in the event an evacuation center is established. Some trail systems may have safety hazards (potholes, low-hanging tree limbs, etc.) that need to be identified and remedied. Occasionally playgrounds need to be repaired or replaced and volunteer labor is needed to construct the equipment.